LG has announced it will be showing of some concepts of its Smart TV service, its version of bringing web content to televisions. It has chosen IFA 2010 to show of the service which is said to be based around the concepts of: Easy, Fun, More and Better. So a bit like a date with Kelly Brook then. LG's Smart TV will have its own Home Dashboard, where you can use applications and access a range of premium content all on a single screen – and you will also be able to add favourite websites here as well. We're expecting the Smart TV concept to land on TVs like the company's recently announced LEX8. The Smart TV interface will be controlled by LG's Magic Motion Remote Control, which will be used in conjunction with the company's wand-like controller which was shown off back in CES 2010. "With the introduction of our advanced SMART TV, LG is able to offer a 'Total Home Entertainment Solution' enabling consumers to enjoy practically any digital content on any smart device," explained Simon Kang, President and CEO of LG Home Entertainment Company. "For consumers who want full control over how and where they get their entertainment with maximum ease and comfort, the LG Smart TV solution may be all they need." 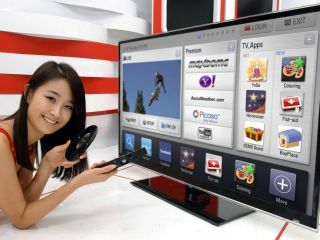 LG's Smart TV will have a UK release date of early 2011.